Months after the events of Spider-Man 2, Peter Parker (Tobey Maguire) attends the opening night of Mary-Jane Watson’s (Kirsten Dunst) new Broadway show, Manhattan Memories. 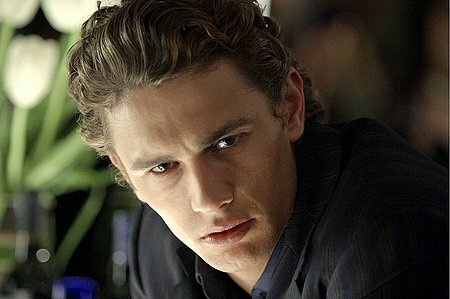 Also attending is Harry Osborn (James Franco) who recently found out about Peter’s secret identity and has accused him of murdering his father, Norman Osborn (Willem Dafoe), who was also the menacing villain, the Green Goblin. As Peter leaves the show, he sees Harry, and runs up to him. He asks Harry to hear his side of the story, but Harry rejects him and leaves. Once home, Harry is seen stepping out of a gas chamber, his muscles considerably larger and with a look of confidence on his face. Peter goes backstage and catches up with MJ, before the two go to a park. Peter spins them a hammock with his spider powers, and the two lay in it, stargazing. As the couple leans in for a kiss, behind them a meteor falls nearby. Unknown to them, a strange, black substance crawls out of the meteor, attaching itself to Peter’s moped as he and MJ leave. Meanwhile, Flint Marko (Thomas Haden Church), an escaped convict, climbs through his sick daughter’s bedroom window and watches her sleep with machines attached to help her breathe. After a few minutes, he goes into the kitchen to find some food, but is caught by his wife, Emma. He tries to tell her that he was wrongly accused for the apparent murder of a man, but Emma shouts at him and his daughter opens her bedroom door; she hands Marko a small locket with her picture in it, and Marko promises that he will find the money to make her better again, somehow, but Emma shouts at him and tells him to get out. He does so. 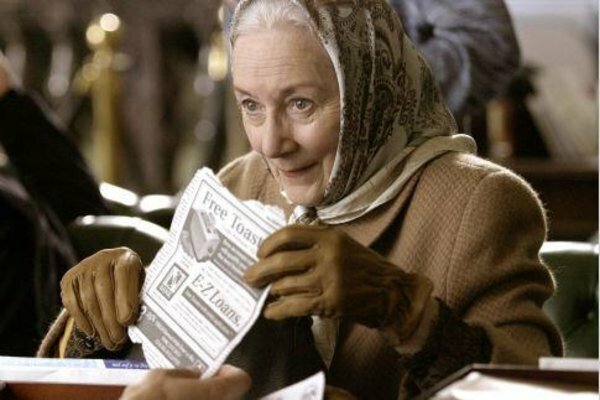 Peter arrives at his Aunt May’s (Rosemary Harris) apartment and tells her that he is planning to propose to MJ. May tells him that he needs to put her before himself, and he convinces himself that he can do it. May then tells him the story of how Peter’s Uncle Ben (Cliff Robertson) proposed to her. When she is finished, she tells Peter to make the proposal very special to Mary Jane, and hands him her wedding ring as a gift for MJ. Driving back to his apartment, Peter is whisked off his moped by a masked figure on some sort of hoverboard. The masked figure throws Peter into a wall, and then reveals himself as Harry, or the New Goblin. Peter and Harry fight through the streets of New York, and the end result is Harry getting knocked out in an alleyway. Peter takes him to a hospital and watches as they try and revive Harry. At the same time, Flint Marko is running from the cops through the marshlands (fenced test facility). He climbs a security fence, and then falls into a concrete pit, landing on a pile of sand at the bottom. The pit is revealed to be a particle accelerator, and Flint is caught inside it as research tests are begun. When the police finally reach the accelerator, Marko is nowhere to be seen amongst the sand – he appears to have deteriorated into the sand. Peter is told that Harry will be okay, and is led into the ward where Harry lies. Harry has lost his memory, and so he and Peter begin to get along just like the old days. Mary Jane arrives and then she and Peter are asked to leave; Harry tells the nurse that he would give his life for his two best friends. The pile of sand in the particle accelerator stirs later that morning, and a humanoid shape rises out of the sand. 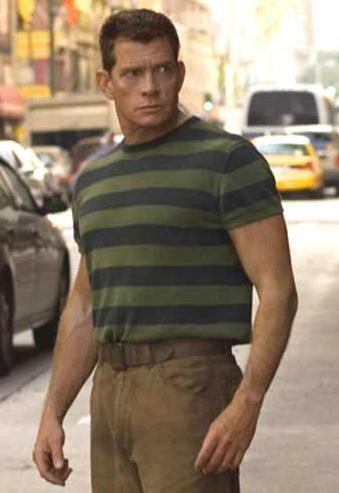 It is Flint Marko, transformed into the Sandman. He sees a small glitter in the sand, and realises that it is the locket that Penny gave him. He picks it up and attempts to stand, willed by his love for his daughter. He regains his human appearance, and starts learning how to walk again. Back at Peter’s apartment, Peter is admiring the ring he is planning to give to MJ when she knocks on his door. He lets her in and she enters, flustered. She reads out a rather negative review of her performance in the play from the previous night; Peter uses his experiences as Spider-Man to try and comfort her, but MJ gets even more upset. In midtown, across the road from and completely unaware of the out-of-control crane, Peter’s lab partner in science, Gwen Stacy (Bryce Dallas Howard), is having a photoshoot in an office building. A rebar slams through the windows behind her, and then drops down another floor and smashes out the floor supports below. The corner of the building drops, and Gwen slides down to the edge of the building and hangs on with all her might. Just as she falls, Spider-Man swings in and catches her, and sets her down. 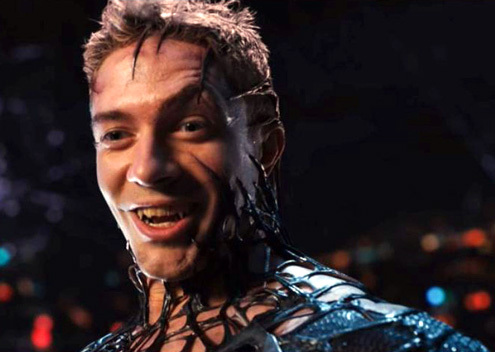 Spider-Man is approached by Eddie Brock (Topher Grace), Gwen’s alleged boyfriend, who tells Spidey that he is the new photographer of Spider-Man. Spider-Man swings off, annoyed with this new photographer, and then goes to the Daily Bugle to deliver the editor some photos of the crane accident. When he arrives, it turns out that Brock has gotten there first, and J. Jonah Jameson (J.K. Simmons) chooses Brock’s photo over Peter’s. Brock explains that he would like a staff job, and Jameson tells the two photographers that if either of them wants the staff job then they will have to get a picture of Spider-Man committing a crime. Peter tells Brock that he doesn’t have a chance at getting the photo, and Peter goes to Times Square. There, he sees a sign saying Spider-Man is to receive the Key to the City. Peter then goes to take Harry back to his penthouse apartment and the two hang out there. Peter gives Harry his old basketball, and throws it to him in the living room. It knocks into a vase and knocks the vase off and Harry effortlessly catches both the ball and the vase. He marvels at his skill, worrying Peter. 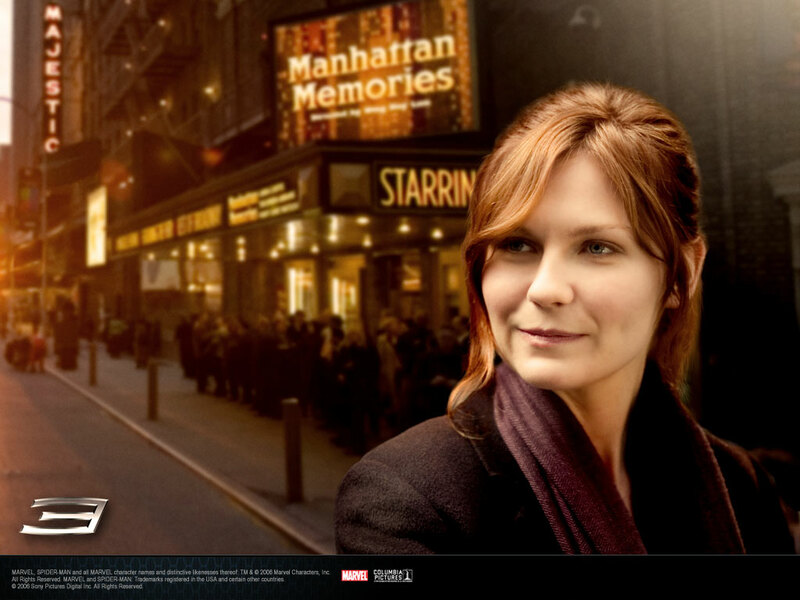 Mary Jane goes to the theatre to attend a rehearsal session, but discovers that after several bad critic reviews she has been fired from the show and replaced. She leaves the theatre, and is startled when she meets a round of applausefrom the crowd, but is disheartened as Spider-Man swings by and she realizes the applause is actually for him. She storms off, frustrated and upset. The next day, Peter attends the ceremony being held for Spider-Man. He meets MJ, who doesn’t tell him about her being fired from the show. She encourages him, and then he walks off. Harry arrives, and he offers to attend her play that night. She tells him that she’s been kicked off, and then wonders to herself why she told Harry rather than Peter. Gwen Stacy introduces Spider-Man as the person who saved her from certain death, and then Spider-Man swings in, performing small stunts on the stage. He drops down and suspends himself at head level with Gwen Stacy, upside down. He tells her to kiss him, for publicity, and she does so in a kiss reminiscent of the one Peter and MJ shared in the alleyway. Suddenly, a cloud of sand flies in, and the ceremony is disrupted. Spider-Man swings off to find out what is going on, and sees the cloud of dust form a person who breaks into an armoured car. Spidey lands in the car and tries to punch the Sandman, but his arm goes straight through his stomach. Sandman punches Spider-Man out of the vehicle, and Spidey swings back in to try and fight off the Sandman. Sandman runs off as Spider-Man realises that the armoured car is about to crash into a large vehicle, and manages to save the two drivers. He jumps out, with Sandman nowhere in sight. The following night, Peter goes to a fancy French restaurant and gives the Maitre d’ the ring for Mary Jane for safekeeping. He sits and waits for MJ, practising his proposal. As MJ arrives, Gwen Stacy also approaches, and Peter introduces her to MJ as his lab partner. This infuriates MJ, and Gwen quickly leaves. MJ asks Peter if he’s trying to push her away, inappropriately kissing another girl with “their” kiss, but leaves when he replies. Peter tries to follow her, but gives up and retrieves the ring. The following morning, Peter tries to contact Mary Jane, but she deliberately doesn’t answer the phone. As he hangs up, the phone rings, and he picks it up. A Detective asks him to go down to the police station, where Peter and Aunt May are informed by Captain Stacy (Gwen Stacy’s father) that the police got the facts wrong surrounding Uncle Ben’s death, and that he was actually murdered by someone else. The cop pulls out a picture of Flint Marko, and Peter instantly recognises him. He storms back home, waiting for any news on Sandman. MJ arrives while he waits, and tells him she wants to support him through this. He tells her he doesn’t need help, and she tries to make him understand that everybody needs help at some point in their lives, even Spider-Man. She leaves, and Peter continues waiting for the police band to give him some news about Sandman… as he waits, he falls asleep. Silently, the black meteoric substance approaches him, and he wakes up hanging upside down in front of a skyscraper window. His Spider-Man suit is now jet black, and has enhanced his powers, making him feel really good. He swings around the city and then visits Curtis Connors (Dylan Baker), his science teacher, who agrees to analyse the black substance. 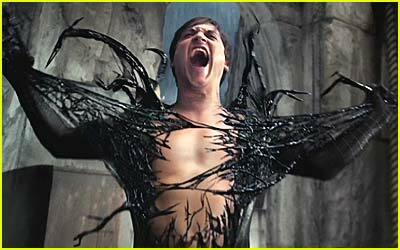 Curtis warns him that the substance appears to be a symbiote, in need of a host to bind to; he warns Peter not to get any on him. Peter goes home and finally hears a report about Sandman on the police band. He puts on the black suit and goes to fight Sandman, with his powers enhanced. Brock turns up to photograph the event, but Spider-Man turns on him, ripping the camera away and smashing it. Spider-Man then goes on to fight and kill Sandman, ruthlessly drowning him and thereby transforming him into a pile of wet mud. Peter goes home and argues with the landlord, Mr. Ditkovich, and then slams his door on him. The landlord retreats back to his room, shocked at Peter’s sudden outburst. 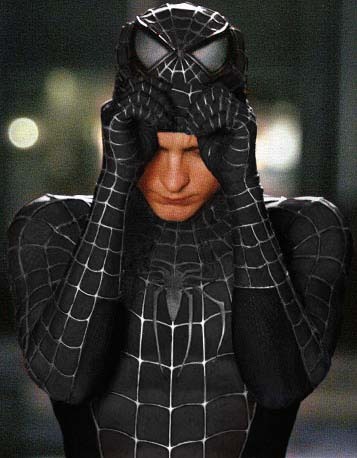 Peter, meanwhile, looks in the mirror and realises that the black suit is altering his personality, and so takes it off. He then visits Aunt May, telling her of Marko’s death at the hands of Spider-Man. She is shocked that Spider-Man could act like that, and tells Peter that revenge can take people over, like a poison, and change them. MJ walks through New York, feeling lonely, and calls up Harry. She visits him, and together they make an omelette, singing and dancing to Chubby Checker’s The Twist. After eating, MJ reads from a play that Harry wrote for her, and then the two kiss. Realising that she actually doesn’t feel anything for Harry, she leaves, much to the dismay of the equally lonely Harry. He suddenly has flashbacks and remembers Peter’s alter-ego; he sees his father in the mirror telling him to attack Peter’s heart. Mary Jane arrives home and hears Peter leaving a message on her answering machine. As he finishes, she is thrown against the wall by the New Goblin, who was lurking in the shadows. With his mask off, he tells MJ there is something she must do for him if she wants Peter to live. Mary Jane calls Peter and asks him to meet her in Central Park, where she dumps him, claiming to be in love with another man. Peter then meets Harry in a diner, where Harry claims that he is the other man. Peter furiously leaves and puts the black suit on, arriving back at Harry’s apartment that night. He furiously attacks Harry, knocking him into a glass shelf and then sneering at Harry that his father had never loved him. Harry throws a bomb at Peter, but Peter snags it with a web and throws it back at him. Peter leaves as the bomb goes off. The next day, Peter strolls through the streets and sees an article about Spider-Man stealing some money from the bank, photo courtesy of Eddie Brock. He recognises the photo as an altered version of one that he took himself years ago. He goes to the Daily Bugle and alerts Jameson to the fraud, who fires Brock from his new position as Daily Bugle staff. The paper has to issue its first retraction in 20 years, which infuriates Jameson. Peter then struts through the streets with an air of confidence, looking at several girls suggestively and clicking his fingers. As a montage, we see Peter on the phone with Dr. Connors, who tells Peter that the black substance, a symbiote, will amplify the characteristics of its host, especially aggression. Peter brushes it off and then we see him in the Daily Bugle, in a tight embrace with Betty Brant, Jameson’s secretary. 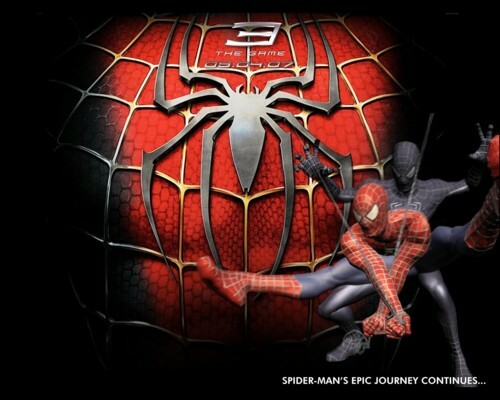 Jameson walks in and the two break apart; Jameson’s assistant, Robbie, picks up some photos of black-suited Spider-Man that Peter placed on Jameson’s desk. Jameson offers Peter the usual rate, but Peter says that if he wants the pictures, Jameson has to give him the staff job. As the last part of the montage, Peter struts into a shop, walking out in a new black jacket and suit, and does a small dance in the middle of the street before finally strutting off. That evening, some mud falls out of a sewer pipe and into a small pond; it reforms, and Sandman crawls out of the water. Strung around his hand is the locket, and he takes one look at it and then walks off, determined to live up to his promise. Peter takes Gwen to a jazz club where MJ is now working, in an effort to make MJ jealous. When MJ gets up to sing, Peter jumps up and starts playing the piano with the band, leaving MJ speechless. He suddenly jumps up and launches into a full dance routine throughout the jazz club, ultimately resulting in Gwen realising that he did it all to make MJ jealous. She leaves the jazz club, and Peter attempts to talk to MJ. 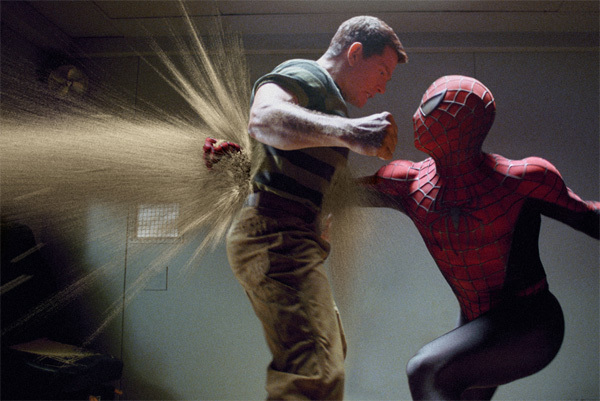 The bouncer tries to throw Peter out, but Peter starts viciously beating him up; when MJ tries to step in, he turns around and smacks her hard on the jaw, sending her flying to the ground. She asks him who he is, and he accepts that he doesn’t know. He leaves, MJ still lying on the floor with a look of shock on her face. 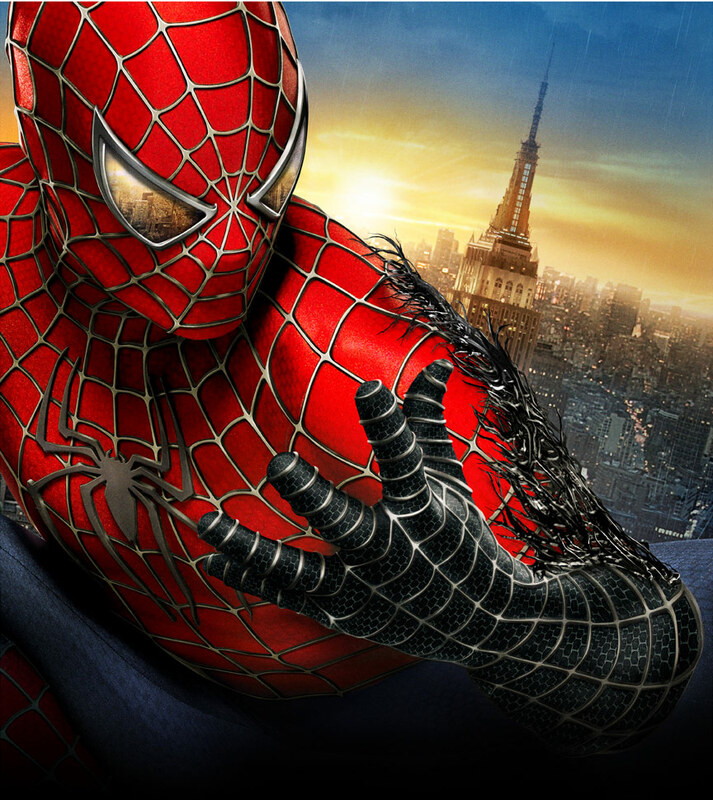 Peter dons his full black Spider-Man costume and swings up to the top of a church tower, where he jumps down and begins tearing at the costume by the church bell. The bell sound seems to pain the symbiote, and it eventually comes off clean. At the same time, Eddie Brock is sitting in the church praying for God to kill Peter. He hears the bells ringing and goes to investigate, and is caught as the symbiote drips off Peter and lands on him. The symbiote changes Brock into Venom, a terrifying variation of Spider-Man with huge teeth and claws. Peter is visited that night by his Aunt May, who tells him that despite everything that he might have done to Mary Jane, he can make things right somehow. He watches as she leaves, feeling comforted. Venom swings through the streets of Manhattan when he is suddenly stopped by Flint Marko, who mistakes him for Spider-Man. Venom tells Marko that together, they could defeat Spider-Man, and Marko agrees to team-up. Venom gets a taxicab, then drives up to MJ’s house and collects her when she flags him down to get to the Jazz Club. He kidnaps her and hangs her high in the taxicab in a web, suspended 80 stories above the ground in an under-construction skyscraper. Peter sees reports of the kidnapping on the news, and then changes into his Spider-Man costume. He goes to Harry’s apartment and asks for help, but Harry rejects him again and turns to show Peter the scar on his face. Peter tries once more to get Harry’s help, for Mary Jane’s sake, but Harry merely growls at him to get out. Peter leaves, and Harry is confronted by the house butler, Bernard, who tells Harry that he cleaned his father’s wound the night he died. He tells Harry that the blade that pierced his father’s body came from his own glider. Spider-Man swings into the construction site and lands on the front of the car; Venom swings in and knocks him through the windshield. He grabs the back of the car and hauls himself up, and Venom knocks him down again. He lands down on the web and then Venom jumps on him. Peter tries to ask Brock to settle the problem some other way, but Venom declines. Peter and Venom topple out of the web and have a midair fight before Peter hits the ground. He is then tripped up as Sandman appears, more than ten times his normal size and growling like a monster. Spider-Man attempts to escape Sandman, but Venom knocks him onto a steel bar and holds him there with his webbing. Sandman pummels him with his gigantic fist while onlookers begin to weep. Just before Sandman can finish Spider-Man off, Harry flies in and throws a bomb at Sandman, and helps Peter up. The two fight Sandman and Venom, and Harry eventually knocks Sandman down while Peter gets MJ out of the taxi and into a safer area. Venom then attacks Peter, and traps him with his webbing, but Harry flies in and attempts to stab Venom with some blades protruding out the front of his hoverboard. Venom grabs his board and flings him off, knocking several rebars loose and collapsing to the floor. The clanging sound pains the symbiote, and Peter remembers back to the bell noise in the church. Venom leaps towards Peter with Harry’s board, intending to impale Peter, but Harry runs in between Venom and Peter, and is himself impaled instead. Venom throws him aside and then leaps towards Peter again, who manages to snap his wrists free and smack Venom around the head with a rebar. Peter circles Venom with the bars, and the clanging sound pains Venom as each one is slammed into the ground. Peter snags Eddie from inside the suit with his webbing and pulls him out; he then throws a bomb from Harry’s glider at the symbiote. Eddie rushes towards the symbiote while the bomb flies through the air, and is killed in the resulting explosion. Sandman approaches Peter and tells him that the killing of Uncle Ben was, in fact, an accident caused by his gun going off. Peter forgives him and Sandman flies off through the buildings while Peter swings down to Harry. He and MJ sit on either side of him, comforting him while he dies. Harry forgives Peter for the death of his father and then dies as the sun rises. Peter, MJ, Gwen, Aunt May and several others attend Harry’s funeral, and then we fade into MJ singing at the jazz club. She stops singing as Peter walks in, and then he steps forwards, his hand outstretched. She takes it and the two embrace, slowly dancing on the spot to the music of the jazz band.